Can Rosanell Eaton succeed in getting the new voter-ID law blocked before the 2016 election? 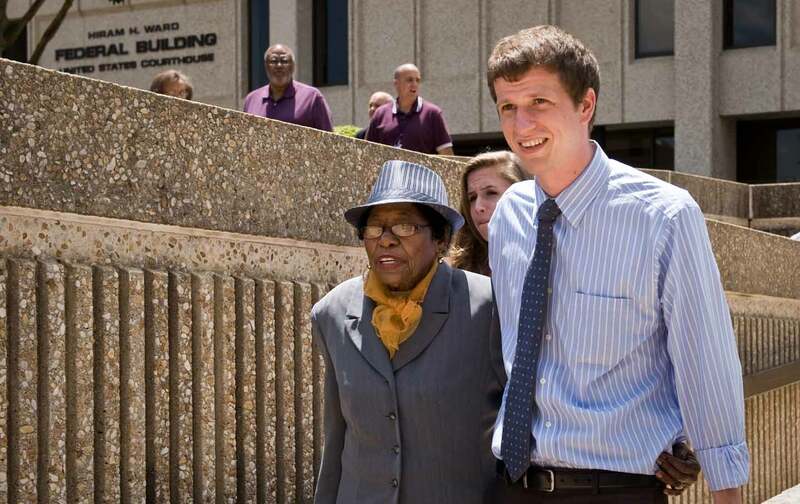 Rob Stephens escorts Rosanell Eaton, a plaintiff in the lawsuit challenging the new North Carolina voting law, out of the Hiram H. Ward Federal Building on Monday, July 7, 2014, in Winston-Salem, North Carolina. AP Photo / Winston-Salem Journal, Andrew Dye). On Monday, January 25, a federal court will hear a challenge to North Carolina’s voter-ID law. Ninety-four-year-old Rosanell Eaton will be a key witness against the law. A granddaughter of a slave, she became a lifelong voting-rights activist, personally registering 4,000 new voters before losing count. But in 2013, after voting for 70 years, she became a casualty of North Carolina’s new voter-ID law, which goes into effect this year, because the name on her voter-registration card (Rosanell Eaton) did not match the name on her driver’s license (Rosa Johnson Eaton). Beginning in January 2015, Eaton undertook a herculean effort to match her various documents and comply with the law. Over the course of a month, she made 11 trips to different state agencies—four trips to the DMV, four trips to two different Social Security offices, and three trips to different banks—totaling more than 200 miles and 20 hours. “It was really stressful and difficult, [a] headache and expensive, everything you could name,” she said. Not everyone will have Eaton’s persistence, resources, and stamina to comply with the law. More than 300,000 North Carolinians lack a government-issued ID, with African Americans twice as likely as whites not to have one. The North Carolina legislature passed one of the toughest voter-ID laws in July 2013—a month after the Supreme Court gutted the Voting Rights Act—along with a multitude of new restrictions, including cutting early voting, eliminating same-day registration, and ending preregistration for 16- and 17-year-olds. Then, just three weeks before a federal court heard a challenge to the law in July 2015, the legislature unexpectedly softened the voter-ID requirement. Those without government-issued photo ID could still vote if they proved there was a “reasonable impediment” to possessing or obtaining the strict voter ID. The “reasonable impediment” provision remains problematic, lawyers for the North Carolina NAACP argue. Those without ID will have to cast a provisional ballot, which Denise Lieberman of the Advancement Project calls a “separate and inferior voting process.” Any voter in the county can challenge the validity of that ballot, which is not guaranteed to count. North Carolina rejects provisional ballots at a far higher rate than the national average, according to expert witness Lori Minnite of Rutgers University. Of the 18,749 provisional ballots cast in North Carolina in 2014, more than half—9,793—were rejected. North Carolina is still telling its residents that they need a photo ID to vote, based on this material from the Board of Elections. At best, the modified ID requirement will lead to longer lines and more confusion at the polls. At worst, voters will be turned away because they don’t have the right ID or poll workers enforce the law in an incorrect manner. Moreover, the reasonable impediment provision undercuts the state’s own justification for the law, the North Carolina NAACP notes. In many ways, the amendment raised more questions than it answered. The rationale for North Carolina’s originally enacting a photo ID requirement was to deter in-person voter fraud. But allowing those without such ID to vote simply by signing a “reasonable impediment” affidavit would seem to undermine that justification, particularly against an evidentiary background of no in-person voter fraud in North Carolina and the increased tax dollars that North Carolina taxpayers will need to spend implementing this law. Against that background, one must question what North Carolina’s real motivation is in continuing to insist on imposing a photo ID law at all. From 2002 to 2012, there were only two cases of voter impersonation out of 35 million votes cast in North Carolina, according to Minnite’s research. There have been no new referrals since the legislature passed the voter-ID law, which raises the question: Why was it needed in the first place? The new restrictions had a clear negative impact in the last election. Democracy North Carolina estimated that “the new voting limitations and polling place problems reduced turnout by at least 30,000 voters in the 2014 election.” The group analyzed provisional ballots cast during the 2014 election and concluded that 2,344 rejected ballots would have been counted if the new restrictions, such as eliminating same-day registration and out-of-precinct voting, were not in place. These voting problems occurred before the state’s voter-ID law took effect and before a highly contested presidential election. As voters begin to head to the polls to decide the next president, in the first presidential election since the VRA was gutted, the stakes are much higher in 2016.